On Friday, August 25, 2017, Indiana University of Pennsylvania “cut the ribbon” to open North Dining. This new facility is phase three (the final phase) of IUP’s $37-million dining master plan, IUP Dining Innovations. North Dining, located adjacent to the Northern Suites and the Hadley Union Building parking lot, will be open for lunch and dinner Monday through Thursday, 11:00 a.m. to 7:30 p.m., and for lunch on Fridays, 11:00 a.m. to 4:00 p.m. It offers seating for about 600 people. A dessert station with homemade gelato and crepes. The building also offers a gathering space with seating for up to 68, which can be reserved for meetings and events for those would like to dine in the facility. North Dining also houses the central IUP Dining offices. Construction on this $17-million facility began in May 2016. Luckey noted that the first two phases of the project, Crimson Café and Folger Dining Hall, have been met with great response and success. Tim Grant, vice president for strategic initiatives for Aramark, also delivered remarks at the event, followed by comments from IUP President Michael Driscoll. “Here we are, at long last, at the end of our dining master plan,” he said. “It has been an exciting experience to watch all of the phases unfold; or, perhaps an appropriate metaphor would be to watch the napkin unfold and the table setting being placed in position. “Demolition and construction are, all in themselves, exciting events, with all the noise and movement, but the best part comes after the dust settles and being able to see students interacting with each other over coffee or a meal, solving the world’s problems or maybe just solving the day’s math problems,” Driscoll said. He recognized all of the hard work to meet the timeline of the projects. “Three phases in four years is a pretty lofty schedule—and you did it,” he said. Phase one of the project, the Crimson Café, opened in August 2014. 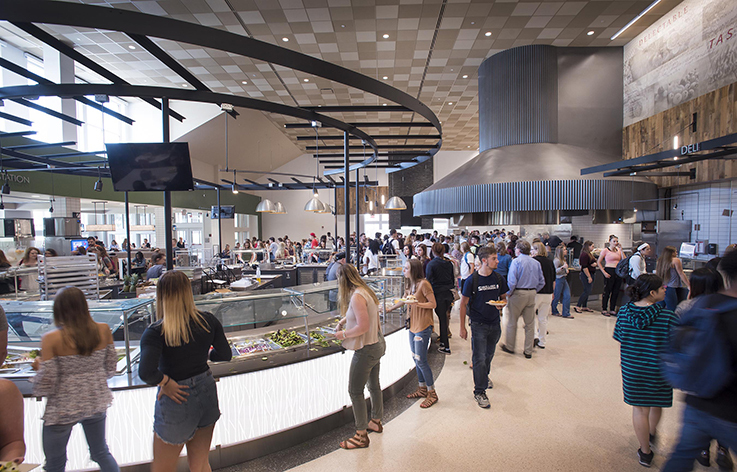 This $6.5-million, 400-seat retail dining facility includes a Starbucks, the Crimson Bistro, Burger Studio, and the Fireplace, plus a selection of grab-and-go items, including soup, salads, wraps, and hot meals. Phase two of the project is a $13.75-million renovated Folger Dining Hall, opened in October 2015. Folger Dining Hall includes the Global Grill, which combines Mongolian, char, and flattop grills preparing international dishes and traditional favorites; the Sandwich Artisan; Olive’s Kitchen with traditional favorites, vegetarian dishes, and features for those with special dietary needs; Pasta la Vista, featuring pizzas and pasta; Produce Market (salad bar); and Great Wraps, located in the lobby of the building. Dining revenues fund the renovation and construction of the three facilities that are part of the Dining Innovations Plan. The IUP Council of Trustees approved the $37-million campus dining master plan in December 2011. The development of that plan by Desmone & Associates Architects, of Pittsburgh, and Envision Strategies, based in Colorado, was approved in 2010 and included extensive study, focus groups, and surveys of students. IUP’s long-range campus facilities master plan was approved by the Council of Trustees in December 2010.